Shiver me timbers! 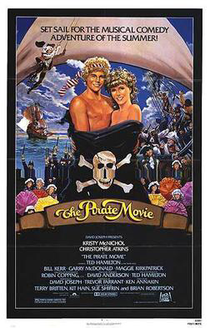 The Pirate Movie is a complete mess of a film, financed in Australia and mixing the original songs of Gilbert & Sullivan's Operetta "The Pirates Of Penzance" and 80's pap as though to emulate the success of Grease, although with spoof humour akin to Mel Brooks' work, except this isn't funny. It's pointless explaining the story, since there isn't one. It's just a collection of silly scenes with an occasional song thrown in amongst some zany humour, sexual innuendos, pathetic slapstick and obnoxious winks which break the fourth wall. The original songs are atrociously bad, even if you take into account that they're supposed to be tongue-in-cheek, and "Pumpin' and Blowin'" is, by far, the worst song on the soundtrack. Christopher Atkins' performance is so incredibly bad, he takes all the heat off the other terrible performances, including Kristy McNichols' incredibly obnoxious and unlikeable leading lady / love interest. The perfect phrase to sum this one up would be "Thar, she blows!"